Putting up cheerleading locker signs is a tradition almost as old as cheerleading itself. Making locker signs can be a fun group activity, and most cheerleaders find that doing locker signs for the players is a great way to boost team morale, communicate with the student body about the upcoming game and promote an overall atmosphere of school spirit. Post locker signs on every fourth or fifth top locker (depending on how the lockers in your school are arranged) announcing the big game. Post locker signs after a game touting special accomplishments of players. For example, if Smith scored the only three-point shot during the last game, a locker sign declaring him the "three point king" might be fun. Use locker signs to draw attention to less attended sporting events such as swimming or track. Celebrate student athletes' birthdays with a locker sign and a bunch of balloons. 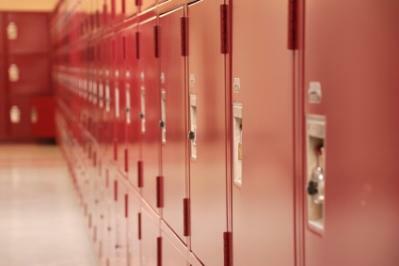 While there's not a right or wrong way to do locker signs, there is some general etiquette that should be followed. The reality is that signs will get torn down, and many will unfortunately wind up on the floor rather than in the trash can. You will win no fans from the janitorial staff if you post dozens and dozens of signs that end up all over the floor. It is bad enough to make an embarrassing move in a game, but to have attention called to it by a lot of people will make it ten times worse. Only put up locker signs that are positive and encourage school spirit. Think how you'd feel if someone posted a sign on your locker for that one time you didn't land the stunt right! If your school has multiple sports teams, don't just make locker signs for football and basketball. Create signs for all sports whether or not you cheer at these games and meets. Likewise, if you're going to post birthday signs, you need to post them for all members of the team rather than just for a certain few. The sky is the limit for your locker signs. You can be as creative as you want. However, consider some of these creative and catchy signs if you're a little stumped for ideas. Tape a Willy Wonka bar to a sign that says: We don't need a golden ticket, we just want you to kick it! Good luck at the game! One of the great things about digital cameras is that you can take pictures and digitally create a montage of highlights from the season's games. This makes a great locker sign for a play off game. Use it to wish your players the best of luck on their way to the championship! Use an atlas or map as a backdrop, and make a sign that says, On the road to victory! Winning the championship one game at a time. A similar sentiment can be used for district championships or other major games. A lot of local eateries are happy to support the nearest school because it generally means extra business for them. See if you can persuade a local pizza shop or even your local McDonald's to give you certificates towards food. Certificates can be dropped inside the locker so they don't get stolen. Post a sign on the outside of the locker that says: Great job! We all appreciate you! The best way to make a lot of locker signs at once is to have a big party. Your squad's captain should arrange the details, but don't be shy about jumping in to help out. Each girl can bring markers, card stock or anything else that you might want to use. If all the cheerleaders work on the signs, the work is sure to go quicker, and it will be a lot more fun!